Chapters 3-6 describe progress, opposition, response to opposition, progress, opposition, response – a continuous cycle. Nehemiah delegated the work wisely, assigning men to rebuild the wall next to their own houses, where they had the most interest. The opposition he faced was both internal and external. Nehemiah had leaders who thought they were too good to work. He had neighboring governors who didn’t want Israel to be helped. There were rumors, discouragement, ridicule, even threats of physical attacks. Nehemiah’s response was always to pray first, then to come up with a plan. In the case of physical attacks, he prepared a defense and planned for the impending attack. His builders were watched over by armed guards and they worked with a “sword strapped at his side while he built” (vs 4:18). In the case of internal oppression of the poor, he addressed the issues, told the people point blank “this needs to stop,” and outlined a way forward. There seems to be a general expectation that when we are doing a great work for God, when we are following him and doing what he has called us to do, we will face no opposition. He has commissioned this work, hasn’t he? Won’t he clear the way for us to work without any trouble? It’s a nice idea, but not reality. Consider Mark 4:35-41. Jesus told his disciples, “Let’s cross the sea.” And a storm came. They thought they were going to die, and they were doing exactly what Jesus himself had said to do. We can’t expect to live life without storms just because we’re doing what God has called us to do. But we can expect God to be faithful. Jesus calmed the storm. In Nehemiah, the work was completed in miraculous time (two and a half months) despite the numerous threats. This part of the story amazes me. In two and a half months, they rebuilt the wall. Exiles had returned 90 years earlier; the Temple was rebuilt 70 years earlier. Yet, in all those decades they couldn’t organize themselves to do a job that would take less than 3 months. Sure it was miraculous timing, but even if it took them 10 times as long, that would still be but a fraction of the time they had been back in Jerusalem. 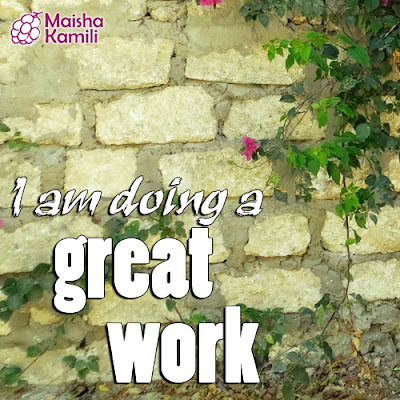 When you do a “great work for God,” do you expect opposition? We should not say, “Someone ought to do something about that.” We should instead get to work. God calls us out of our comfort zone (where we could be content to stay for the rest of our lives) to something greater, bigger than we can imagine. Establish a relationship with God through extended, dedicated prayer times, then pray-as-you-go. People under God’s direction can accomplish impossible tasks. People with no direction accomplish nothing.